The Seiko 7s26 movement is accurate, reliable, and seemingly omnipresent. 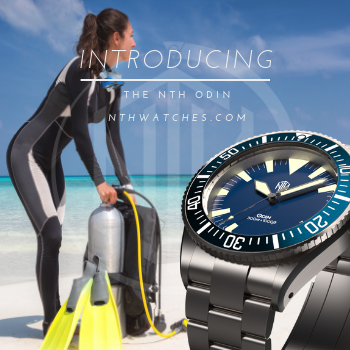 Since its debut in 1996, this hardy unit and its spin-off variants have found their way into just about every affordable Seiko automatic you turn over, mostly the Seiko 5 line and the SKX-series dive watches. This has been a good thing for fans of affordable watches, and even better for those who modify them. Nick, of the aptly named Watches by Nick, is one of these fellows. He got into watchmaking by tinkering with a vintage Omega and soon discovered the online subculture of Seiko customization. He proved to be pretty handy and was soon selling his creations and taking commissions for new work. 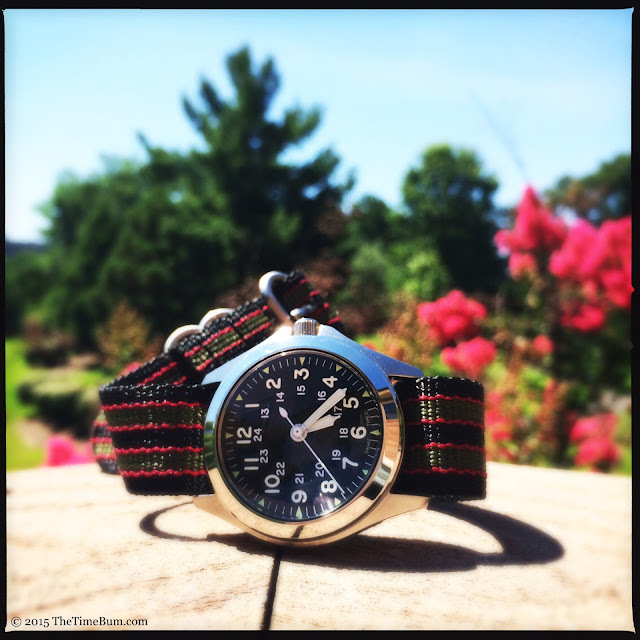 Recently, Nick assembled a field watch and sent it on tour. This traveling watch has just finished its stop at Time Bum Headquarters here in Washington, DC, and I enjoyed its company. The donor for the Field Standard watch is a SNKL08 with the ubiquitous 7s26. 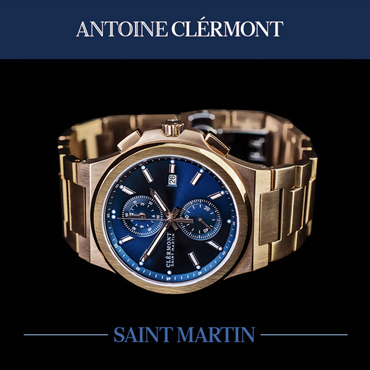 The case is 39mm wide, not counting the crown guards, and features a brushed finished with a polished bezel. Nick fit a Dagaz military dial and vintage-style hands. 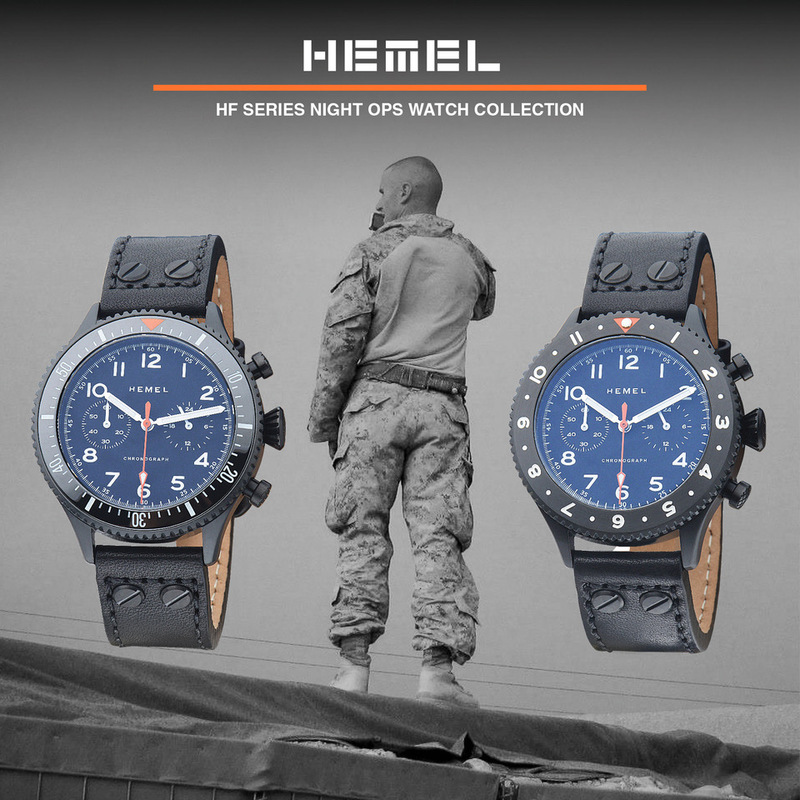 It looks similar to the U.S Government field watches issued during the Vietnam War. It is larger than the original, but still a mid size watch, and the bright bezel dresses it up a bit. 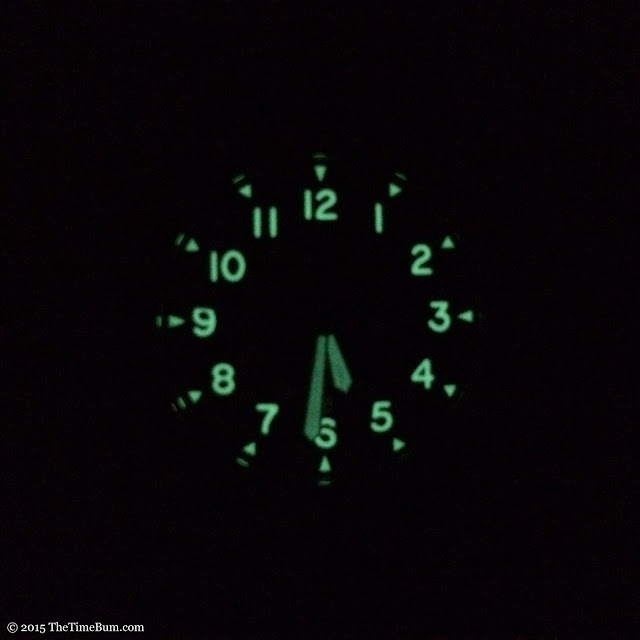 At night, C3 SuperLuminova pops to life. My favorite aspect is the Swiss crystal, which has a high dome and a flat back that act like a giant date cyclops. I like big domes - and I cannot lie. The arc works nicely with the angle of the bezel and the magnification is a really cool effect. The traveler arrived on a 20mm nylon Bond Zulu strap, with seemed perfectly fitting but the bit of shine on this watch would lend itself well to a more tailored leather strap. 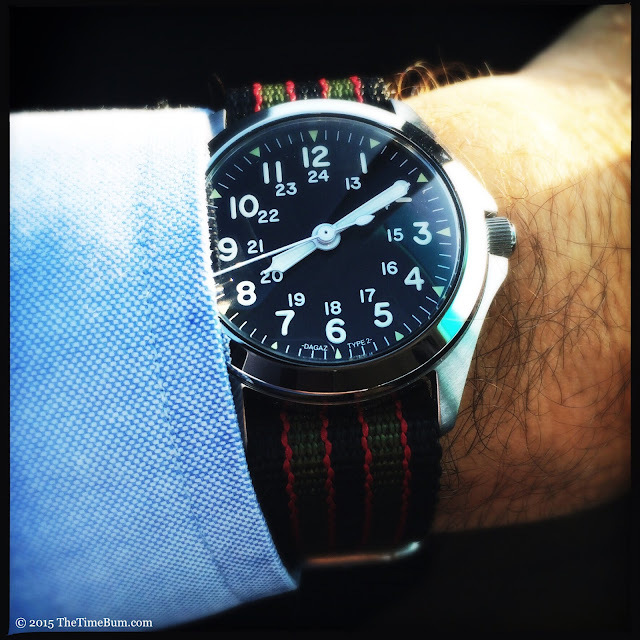 Nick has a similar watch on his site now called the Field Standard that is pictured on padded black leather with white stitching and it looks rather sharp indeed. The Watches by Nick currently for sale run between $250 and $375. The Field Standard sells for $290. Nick says he could recreate the Traveler for about $285. 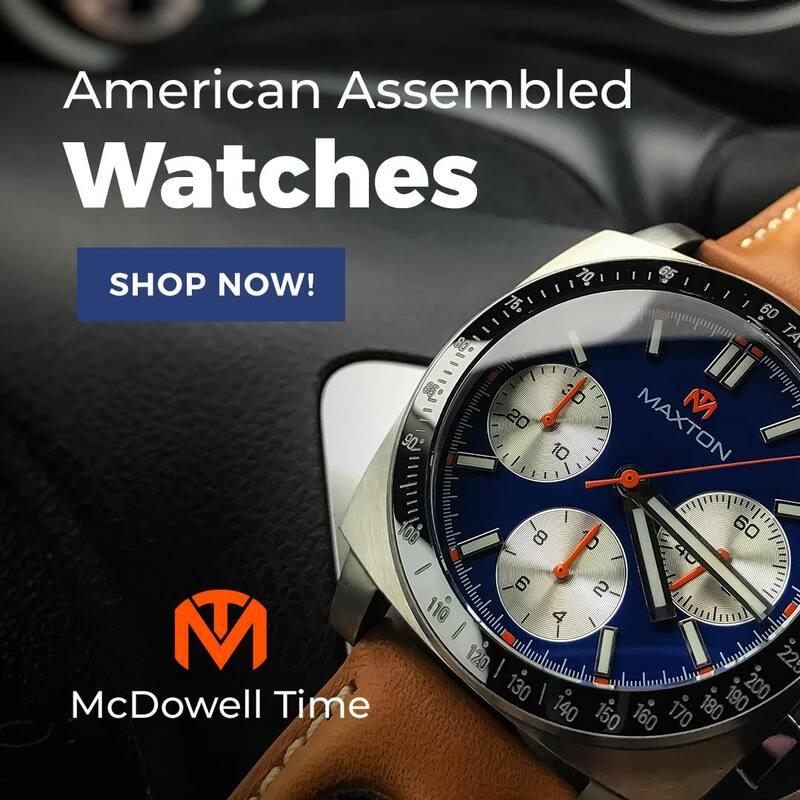 Obviously, the price of any watch will depend on the donor, parts, and labor, but these are well within the affordable range and perfectly fair for a uniquely modified piece. Want a Nav-B dial in a SKX007 body? A 62MAS-Seiko 5 hybrid? 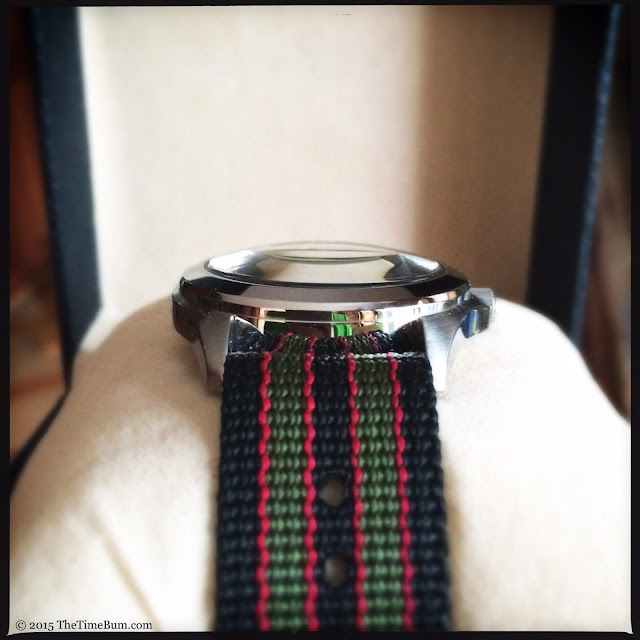 Maybe a Tudor-inspired diver with a green bezel insert? Cooking up your creation is half the fun. 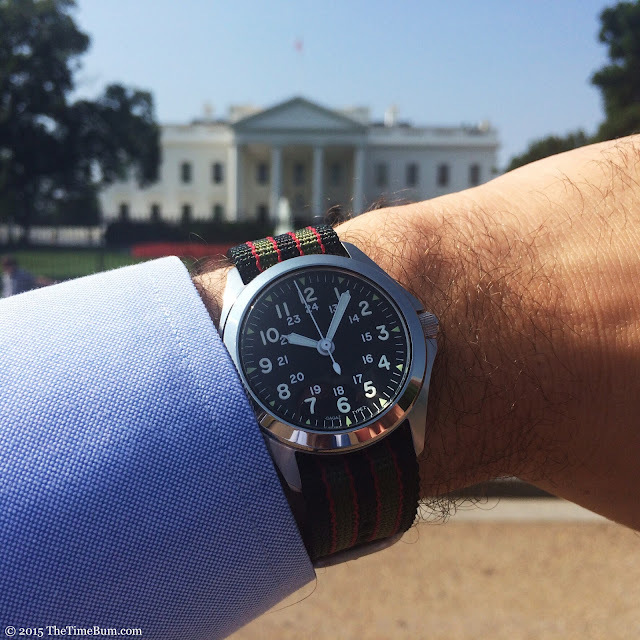 Look for the Traveler on Instagram (#thetravelingwatch or @watches_by_nick) and see watchesbynick.com for more.